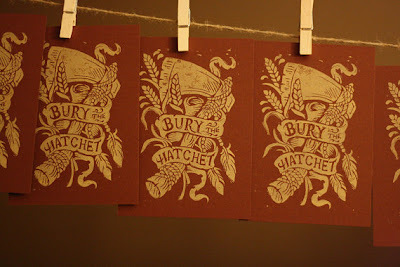 Straw Castle Design "Bury the Hatchet"
Artwork has become more affordable and accessible as artists have been able to expand their presence on the internet. Small prints are usually available in 4″x6″ and 5″x7″ sizes, and inexpensive frames for these sizes are available almost anywhere. I’m really attracted to the colors in this Straw Castle block print. It is available in their Etsy store for only $4.99, but act quick as it is limited to just 30 prints. Finish it off with a dark brown or natural wood frame, which you can probably find for less than $10. If you have a few minutes to kill, you can see more of Derrick Castle’s portfolio at strawcastle.com, and works for sale in his Bigcartel and Etsy shops.